Taking a toddler for a hair cut can be a harrowing experience – ask me! “I don’t want to sit in that chair” to being utterly terrified of the “stranger” coming near them to only scare them with instruments that could harm– these are the thoughts that go through the these tiny tots when all we are trying to do as parents is to get them comfortable with a short haircut. Salons these days train the “hair experts” in the art of distraction while hair is being snipped, trimmed or styled. From chatty stylists to fancy seats, here’s where to go. One of the most popular salons in Bangalore, Divas and Dudes has fancy seating for the kiddos - Batmobiles, motorbikes, horses and even a pretty pink car. The staff really have immense patience and do their job impeccably with the incessant crying and the parents trying to pacify their child. The girls even have spa services with nail art and manicures to keep them happy, if they’re the girly girl. The true heroes of haircuts, we must say; they know exactly how to calm a child down and proceed to get your kids smart and stylish all at the same time. The ladies, and two wonderful gentleman, at the salon have a real knack of keeping the tiny tots engaged all by just talking to them whilst the Mammas and Papas pamper themselves alongside their kiddos. Almost like a toy store, this salon truly welcomes a child without needing to coax or bribe. With palm tree swings, 3D puzzles and cartoons being played while the experts do their snipping. Kids can even get their nails done or even a temporary tattoo when here. You might be surprised to see this as part of the list! Mamas and the kiddos (slightly older ones) can sit side by side to have their hair and nails done – how rad is that? 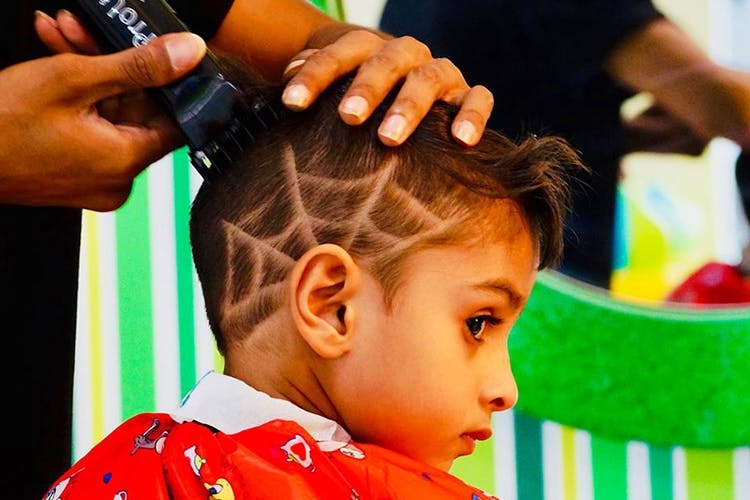 O2 believes that kids love haircuts, so they are just there to facilitate just that. With highly trained experts managing whole family’s needs, this posh place in best suited for slightly older kids (above three) who are really particular about how their hair should look but they are real pros when it comes to handling toddler haircuts too! With a little section for kids that includes funky car chairs, parents too can sort out all their salon needs. An exclusive kid’s salon that has A-Z of services just for your kids! That said, it’s more for tweenagers as it offers teen manicures, pedicures, nail art and more. Of course, they do welcome little toddler for perhaps that first hair cut, and will easily distract the babies with plenty of toys and colourful distractions. Apart from salon services, they have water games and they even organize customised birthday parties with the services that your require. Yes, this unisex salon has been around for a long time and we can find it in every nook and corner of Bangalore. They have become quite the experts in catering to the tiny humans with the years of having dealt with them. So if you need the pros of pros, look out for Naturals in your area and you are all set. They are not really specifically for kids, and don’t offer too much. But their experience in swiftly cutting hair means you will be in and out with the children before the little ones realise.